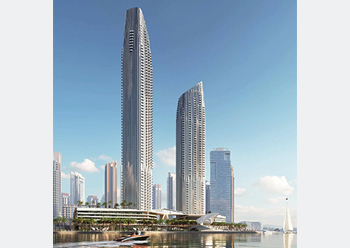 Address Harbour Point Hotel ... ASGC has been appointed lead contractor. ASGC, one of the leading construction groups in the UAE, has started work on the Address Harbour Point Hotel, a luxury hospitality project comprising two towers located next to Creek Heights in Dubai, UAE, following its recent appointment as the main contractor by Dubai Creek Harbour. Located on Creek Island Dubai, a premier district where the first residents will move in this year, Address Harbour Point Hotel is also in close proximity to Creek Marina, which features yachting facilities, complete with a yacht club, three hotels, a promenade, landscaped pedestrian walkways, art installations, gourmet restaurants, cafés and entertainment venues. Address Harbour Point comprises two towers – 65 and 53 storeys respectively –which are located next to Creek Heights, a collection of luxury waterfront homes. Featuring 202 luxury rooms, it will offer a choice of one-, two-, three- and four-bedroom homes and an exclusive ‘Sky Collection’ of four- and five-bedroom penthouses on the upper levels, says the construction firm. Address Harbour Point in Dubai Creek Harbour is just a short drive from Downtown Dubai and Dubai International Airport offering easy access to the city and some of its biggest global attractions. “For nearly 30 years, ASGC has been delivering turnkey special projects across the UAE, employing more than 16,000 construction specialists and workers across the nation,” he adds. ASGC is currently working on a string of prestigious projects, which in addition to the Address Harbour Point Hotel include the Mohamed bin Rashid Library, a 92,903-sq-m development which will accommodate 4.5 million books and also include a 500-seat theatre, in Al Jaddaf overlooking the Dubai Creek; Dubai Arena at City Walk, a new, state-of-the-art multi-purpose arena with an approximate capacity of 20,000; and the 29,159-sq-m Sustainability Pavilion adjacent to the Sustainability Zone of Expo 2020 Dubai site. Established in 1989, ASGC is a vertically integrated construction group that is best known for delivering turnkey special projects in the UAE. The company owns the majority of its supply chain and utilises mostly in-house resources, giving it a high degree of control over project quality and timely delivery. Over the years, it has been involved in landmark projects across diverse sectors such as residential, commercial, leisure, hospitality, healthcare, education, social infrastructure and industrial.